America could become the most expensive solar country in the world. But could it also become a manufacturing leader? Here’s what you need to know. America just took a step closer to another solar trade war. But not just with China. With the rest of the world. Today, Suniva filed a petition with U.S. International Trade Commission calling for new tariffs on solar cells and minimum prices for solar modules imported from around the globe. The company is asking for duties of 40 cents per watt on imported cells and a floor price of 78 cents per watt on modules. If implemented, those prices would make America the highest-priced solar country. The solar industry has been waiting for this filing since last week, when Suniva hinted in a Chapter 11 bankruptcy declaration that it would seek to open up another trade case. The process is now underway. Suniva, a manufacturer based in Georgia, declared bankruptcy last Monday. 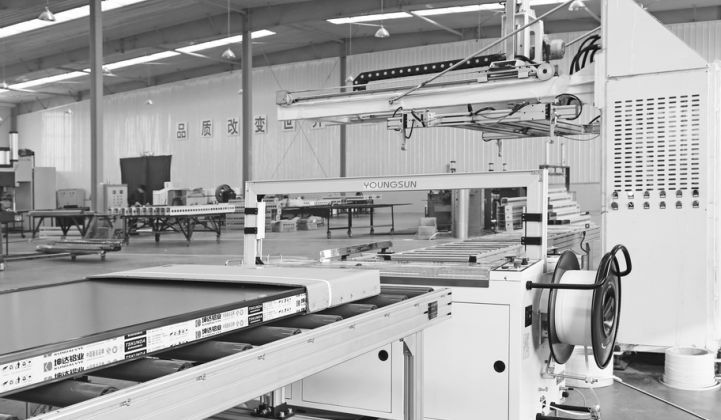 The company built manufacturing operations for high-efficiency silicon cells and modules in Georgia (450 megawatts of cell capacity) and Michigan (200 megawatts of module capacity). But it lost more than $50 million since 2015 as global module oversupply pushed prices to record lows. Suniva couldn't compete with module prices at 35 cents per watt. It blamed China and other Asian countries for "flooding the U.S. market" with modules below cost. Now Suniva is looking for relief. And it's doing so in a unique way. The company filed a Section 201 petition under the 1974 Trade Act -- a tool that could allow the president to implement tariffs, minimum prices or quotas on solar products from anywhere in the world if "serious injury" is proven. It was last used by the steel industry in 2002, which resulted in a three-year tariff schedule on steel products from a number of countries. If anti-dumping and countervailing duties investigations at the Commerce Department are a scalpel, then Section 201 is a hammer. It is a comparatively swift, blunt instrument. After a petition is filed, the U.S. International Trade Commission has 120 days to review. And if it decides that the industry is facing serious injury, it has another month or two to issue recommendations. The president then has the authority to follow the recommendations -- or potentially act on his own. Trump's camp specifically cited Section 201 on the campaign trail. Although solar doesn't seem to be on the president's mind, this could be a potential win for his trade agenda. Suniva has done a lot of the leg work for the administration. Suniva is making a big ask. It wants to nearly double the price of imported solar modules. "Thus, petitioner seeks a recommendation to the President of four years of relief of an initial duty rate on cells of $0.40/watt, along with an initial floor price on modules of $0.78/watt. Petitioner also seeks other equitable remedies that will effectively assist the domestic industry to make a positive adjustment to import competition. Finally, petitioner seeks a recommendation from the Commission to the President that the United States negotiate with trading partners to address the global supply imbalance and overcapacity in CSPV cells and modules." The company says the proposed four-year tariff schedule will "allow the domestic industry to survive long enough that it can benefit from actions of the U.S. government, and foreign governments and producers to address the massive excess global capacity that has depressed global CSPV cells and modules prices to unsustainable levels." If the International Trade Commission and President Trump agree with Suniva's case, the downstream pricing environment could change dramatically -- particularly for utility-scale solar developers. Ben Gallagher, a solar analyst with GTM Research, described the impact to utility-scale projects: "Those prices increase current U.S. utility single-axis tracking system pricing from $1.08/Wdc to $1.56/Wdc -- which is...more or less 2015 system pricing." Jade Jones, a senior solar analyst with GTM Research, explained the impact on module pricing: "That would bring us to module price levels seen in the last oversupply cycle. So similar to prices in 2012. That would also make the U.S. the highest priced market in the world, with module prices more than double other regions." GTM Research put together an analysis of the consequences. You can find it here. Demand destruction in the utility-scale sector "could be quite significant," said former SEIA President and CEO Rhone Resch, speaking on a briefing call organized by Roth Capital Partners. "You're going to double your PPA prices. You will have several gigawatts of potential demand erosion." The upstream impact is less clear. It would make U.S. manufacturers more competitive -- but in a smaller downstream market. Resch said the tariffs could get more companies to "re-look at the United States" for expansion. But it's unclear how much capacity would move to America. "A lot of that capacity is in the process of being built. It probably would not be easily shifted to the U.S.," said Phil Shen, a senior research analyst at Roth Capital Partners, speaking on the briefing call. According to Suniva, failure to implement widespread tariffs would prevent any expansion of the U.S. solar manufacturing sector: "Without global relief, the domestic industry will be playing 'whack-a-mole' against CSPV cells and modules from particular countries." There are also geopolitical implications. These actions could apply to every country. At a time when the Trump administration is considering breaking America's commitment to the Paris climate agreement, this could create another diplomatic sticking point. What are the chances of action? "Over 50 percent," said John Gurley, a trade lawyer and partner at Arent Fox LLP, during the briefing call. "Like every lawyer, I speak with triple caveats. One never knows where this will go. History tells us it's more likely we'll get a remedy than not." A final review could come by August. If the government finds injury, it could recommend action by September. If the president agrees, he could make a final decision by October or November. "There's going to be a lack of clarity for several months. It makes it very difficult to predict," said Gurley. SolarWorld, the German manufacturer that led the original trade case against Chinese imports, issued a muted reaction to Suniva's filing. "SolarWorld -- as the largest U.S. crystalline-silicon solar manufacturer, with more than 40 years of U.S. manufacturing experience -- will assess the case brought by Suniva but prefers that any action to be taken against unfair trade shall consider all parts of the U.S. solar value chain. We're committed to helping to find a way that also considers the interests of other parties playing fair in the U.S. solar market," said Juergen Stein, the company's U.S. president, in a prepared statement. Abigail Ross Hopper, the new president and CEO of the Solar Energy Industries Association, came out in opposition. The organization speaks for thousands of developers and installers, who will likely be opposed to any new trade actions. "We strongly urge the federal government to find a resolution that bolsters the competitiveness of American solar cell and panel manufacturing, which employs approximately 2,000 people in the U.S., without erecting new trade barriers. SEIA opposes any resolution that restricts fairly-traded imports of solar equipment through new tariffs or other barriers that endanger the livelihoods of the 260,000 American solar workers and their families living in every state in the Union," said Hopper in a statement. UBS equities analysts suggested the impact would be a net-negative for America's solar industry. "This appears substantially more negative than positive for the U.S. solar industry, though ASP-challenged SPWR and FSLR could see a benefit for utilizing domestic manufacturing (only FSLR currently has any substantial running lines in Ohio, SPWR could plausibly bring P series technology in). As the vast majority of U.S. solar jobs are non-manufacturing (installation, sales, technician) in nature, a substantial ramp in ASPs would threaten the economics of incremental installations (including developers with bids assuming cost declines) and adds risk to our input cost decline thesis for RUN and other resi/developer peers. While we emphasize that panels are currently no more than ~10% of the install cost for resi, 10-30/W cent increase in panel prices would prove quite disruptive and substantially problematic for the lower cost/w C&I and utility-scale markets, particularly for development contracts without firm panel delivery." Meanwhile, the bloodbath in solar manufacturing continues. GTM Research compiled the latest U.S. layoffs. Suniva: 230 layoffs between Georgia and Michigan as of Chapter 11 filing in April 2017, with an additional 24 layoffs planned. “Temporary shutdown” of production facilities in Michigan and Georgia in Q1 2017. Mission Solar Energy: 170 layoffs in March 2017, and plans to reduce its Texas manufacturing capacity from 200 MW to 48 MW. Tesla/SolarCity/Silevo: Tesla noted in its annual 10k filing that Silevo will not achieve its volume production targets and essentially signaled an abandonment of the Silevo technology. Instead, Tesla will partner with Panasonic, with the 1 GW Buffalo, New York facility expected to start production in summer 2017 and to be ramped to full capacity in 2019 -- a delay from earlier targets. First Solar: 450 layoffs for Perrysburg, Ohio production facility in November 2016 as part of strategic shift and retooling for Series 6 thin-film module. Roughly 1,000 employees remain on staff at facility, according to The Toledo Blade. Panasonic: 50 layoffs in Salem, Oregon in February 2016 while production volume winds down. 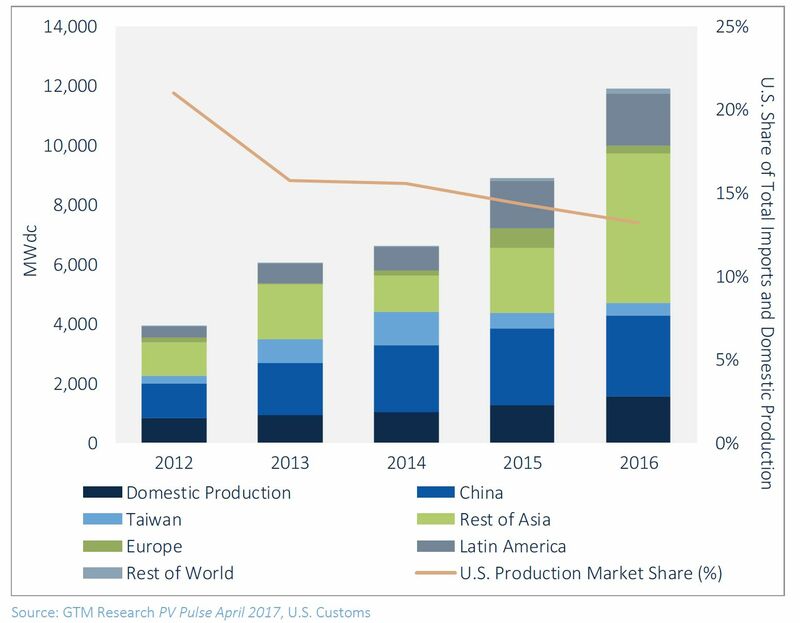 And while America now hosts 1,600 megawatts of solar module manufacturing capacity, the country's share of the global market continues to drop. Suniva believes its petition is the last line of defense against this trend. "The evidence clearly indicates that, given the response of the largest global manufacturers, such a 'targeted-country' strategy is set up for failure. The global industry has proven, to the sum of billions of dollars of investment, that it will go to exceptional lengths to avoid investment in the United States, and that given any loophole, will prosecute against that loophole vigorously. It is for these reasons, that this action, with its request to add tariffs to subject goods made anywhere outside the United States, is the sole effective cure," wrote the company in its petition. In a bizarre twist, Suniva is majority-owned by Shunfeng International Clean Energy, a Chinese company.